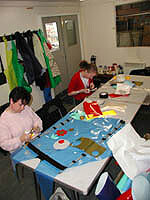 Kite making is a very popular and relatively easy workshop session. As well as being simply made, decorating kites is fun and can be really therapeutic. Taking the process to its conclusion by finishing the kites with bridles and flying lines and then actually flying them is a joy. However kite flying is totally dependent on weather and the physical situation. Open ground and a nice wind are essential and health and safety issues are the main priority. Overhead power lines a very serious danger to be avoided at all costs. 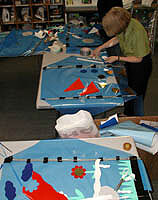 The making and flying of the kites is best planned as two seperate sessions with the making session indoors in as much space as possible. 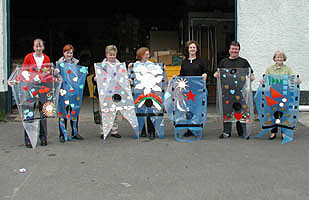 The pictures below show a training session at the Play Resource Warehouse Belfast and below them is an afternoon session from Easter Tuesday 2003 at the Ulster History Park near Omagh. Most of these images can be clicked on to see a bigger image.